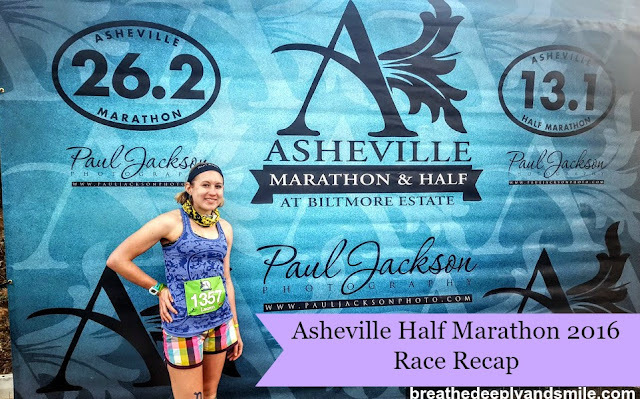 In March each year, the Asheville Marathon & Half Marathon is held on the historic Biltmore Estate grounds. Biltmore is America's largest home and is a private estate owned by the Vanderbilt family. It's over a 7 hour drive from the Baltimore area down to Asheville, NC so we decided to fly and make it into a little trip for my spring break. This was definitely the prettiest race I've ever run! 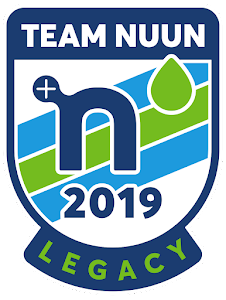 The race is at capped at 1,400 runners in the half on Saturday and another 1,400 runners in the marathon on Sunday, as well as the option to run a back-to-back race challenge over the weekend. The Expo was pretty small and a little unorganized but convenient to get to. I picked up my bib on Friday and then spent the rest of the day relaxing in Asheville. Pre-Race: My boyfriend's sister was running this race as her first half marathon so we got to the race extra early. We bought tickets to take the shuttle from a local hotel onto the race grounds to be safe and avoid any traffic or parking issues getting on the estate grounds. It was actually pretty nice because we hung out in the Biltmore Village on the grounds so I got to use a real bathroom and had a place to sit before heading to the start line. It was a little chillier than I expected before the sun came up, but I knew that temperatures would be close to 70 degrees as the high for the day. I was rocking a Lululemon Run Swiftly tank, Lululemon speed shorts, Pro Compression shamrock socks, Bondiband headband, November Project buff, and the Mizuno Wave Catalyst running shoes. 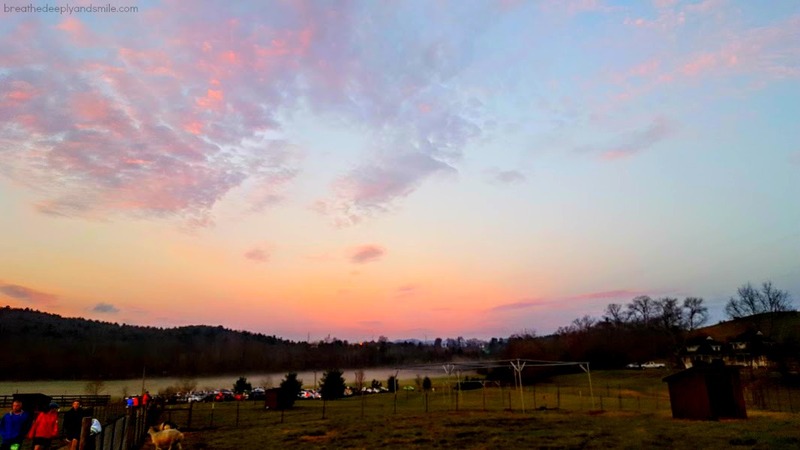 As the sun came up over the grounds, it was already scenic and beautiful! 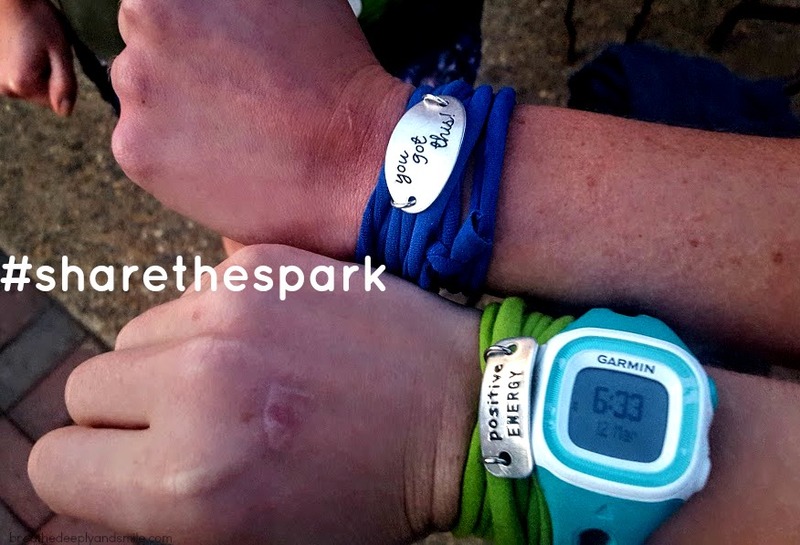 I was really excited to #sharethespark with my boyfriend's sister and give her a little Momentum Jewelry motivation for her first half marathon! I got to meet some fellow Team Nuun ladies and snap a quick photo with them before the race, which was so much fun! 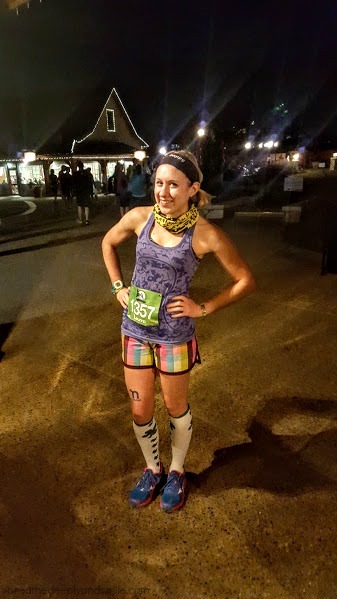 I had a banana and peanut butter along with some Nuun as I was getting dressed and then ate a Munk Pack squeeze before heading to the start line. Since the race was limited to only 1400 participants, there were no corrals and lining up was very quick & stress-free. Disclaimer: This is a sponsored post on behalf of Miles & Paces. I received Miles & Pace product for review. As always all thoughts & opinions are my own. Miles & Pace is a super cool and laid back active lifestyle brand that pairs running motivation with awesome graphic tees and trucker hats. I found the company via social media and ended up winning one of their trucker hats in an Instagram giveaway. 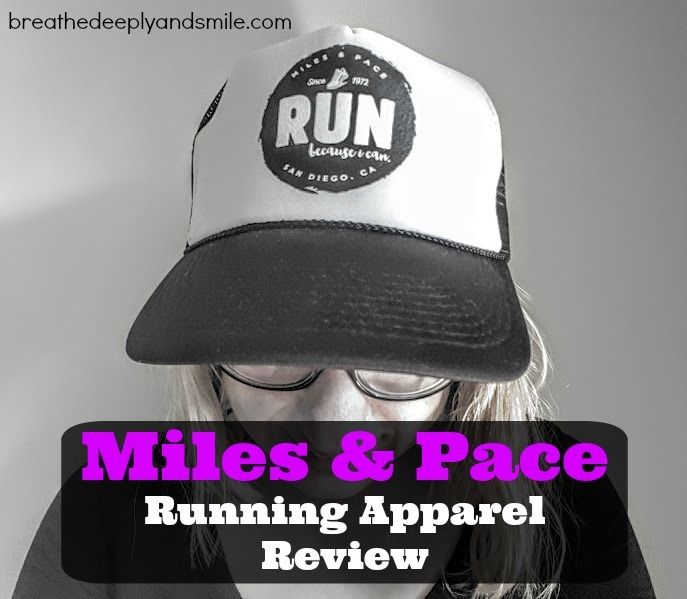 I was really excited to get the chance to review a few items from Miles & Pace after reaching out to them. 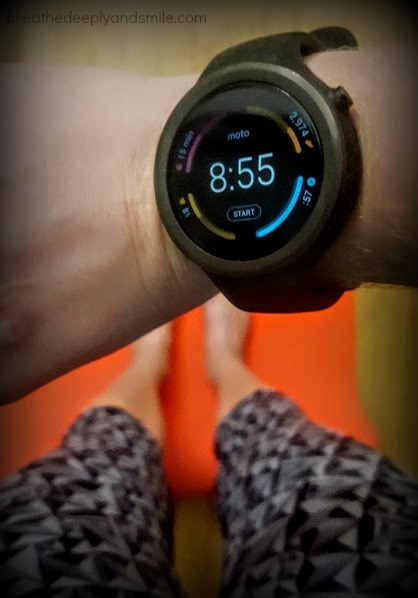 I love running and athlesiure apparel that is cute and graphic and goes perfectly with my almost daily uniform of yoga pants and leggings. 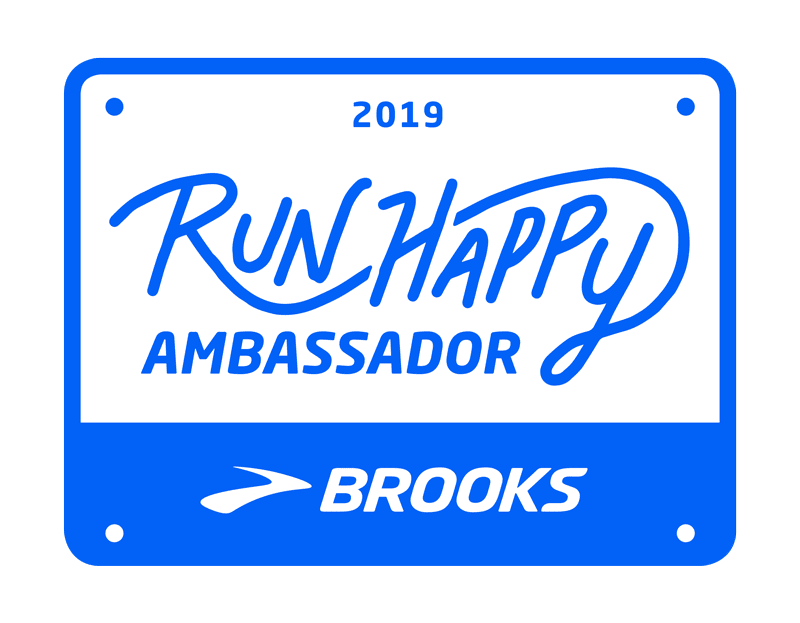 I also love the fact that the company is run by an awesome woman from California and that her and her husband are both runners. They hadn't really found the kind of cool and comfortable running-inspired gear they were looking for at race expos so decided to make their own! Miles & Pace is all about not only creating cool laid back running gear, but also spreading inspiration and motivation in the running community that anyone can run. 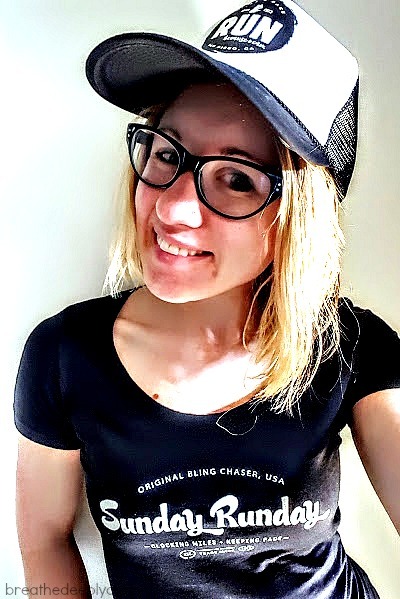 The little phrase on the trucker hats says "I run because I can", which is a beautiful reminder that all runners can relate to. My running motto and mantra is "stronger than you know", and during tough runs I always remind myself how lucky I am that I am able to physically run. Miles & Pace has a message and brand philosophy that I can totally get behind! 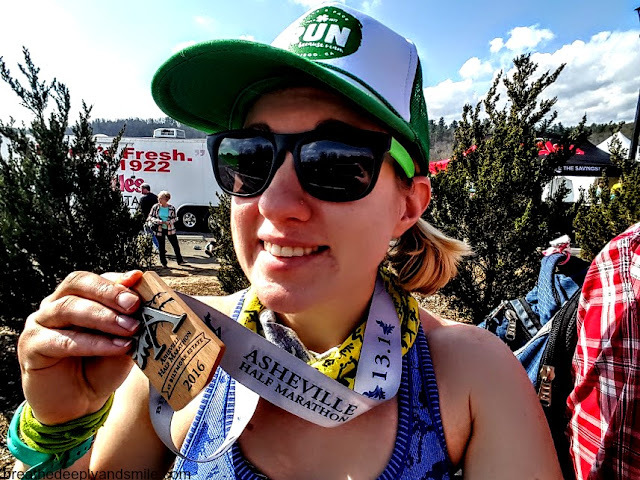 I rocked their St. Patrick's Day green trucker hat at the Asheville Half Marathon this past weekend. It was perfect for keeping me a little shady after the race when there wasn't a cloud in the sky and the sun was shining. Plus trucker hats instantly make you look cool. In addition to fun trucker hats that Miles & Pace sells they also have these awesome shirts and tanks in men's and women's styles. I picked out the Sunday "RUNDAY" scoopneck black tee. They have the tops in all different colors so you can choose your favorite! I will say in the ladies style of shirts it runs a little small & fitted so I would size up one size larger than your normal size. C'mon, I definitely needed a shirt that proclaimed I was the "original bling chaser, USA". From my experience, it is also the perfect shirt to wear post-run at Sunday brunch. It also lets everyone know that you are a runner and are therefore awesome as well as shouldn't be judged for devouring a stack of pancakes because you ran today. Just saying. Miles & Pace also just came out with this awesome craft beer-themed shirt which I am definitely ordering ASAP because it combines two of my favorite things-running & craft beer. I run for beer all the time! Go check out their hats and shirts and be sure to give Miles & Pace a follow on Facebook, Instagram, and Twitter! What is your favorite running motto? 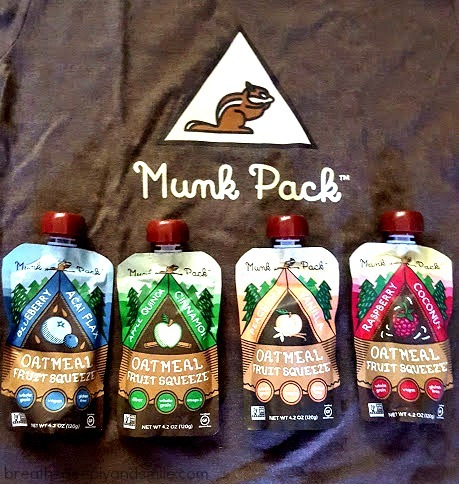 Disclosure: I received a complementary brand ambassador package of products from Munk Pack for review. This post contains an affiliate discount code. As always, all opinions are my own. As a lady on-the-go and chronic snacker, I love sharing my new favorite finds with my readers. 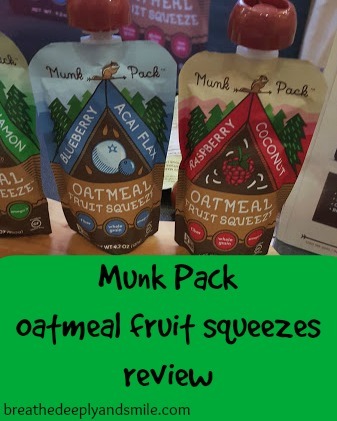 I discovered Munk Pack oatmeal fruit squeezes as one of the showcased new products at Expo East 2015. I loved the outdoorsy booth and as an oatmeal fanatic, was intrigued by the idea of oatmeal in a pouch as a snack. I later learned it's also great for hiking and running! 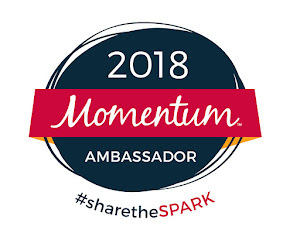 After learning more about the brand philosophy, I'm super happy to be working with Munk Pack to fuel all of my adventures! Munk Pack oatmeal fruit squeezes are vegan, non-GMO, gluten-free and made with whole grains. They also are made of BPA-free packaging. Munk Pack oatmeal fruit squeezes contain 3-4 grams of fiber each and omega 3s. The only sugar in the oatmeal fruit squeezes comes from the fruit. The pouches have a twist-off cap and then you just eat right out of the pouch. Each oatmeal fruit squeeze ranges from 90-110 calories which makes it a great small snack.The four different flavors of Munk Pack are: Apple Quinoa Cinnamon, Blueberry Acai Flax, Raspberry Coconut, and Peach Chia Vanilla. Disclaimer: I received a complimentary Good Luck Box as a Credit Union Cherry Blossom Race Ambassador. No other compensation was received. As always all thoughts and opinions are my own. 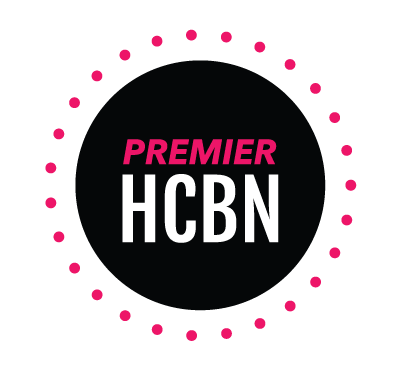 Subscription boxes and gift boxes having become increasingly popular in the last few years. There is a box of goodies you can buy for every interest it seems. 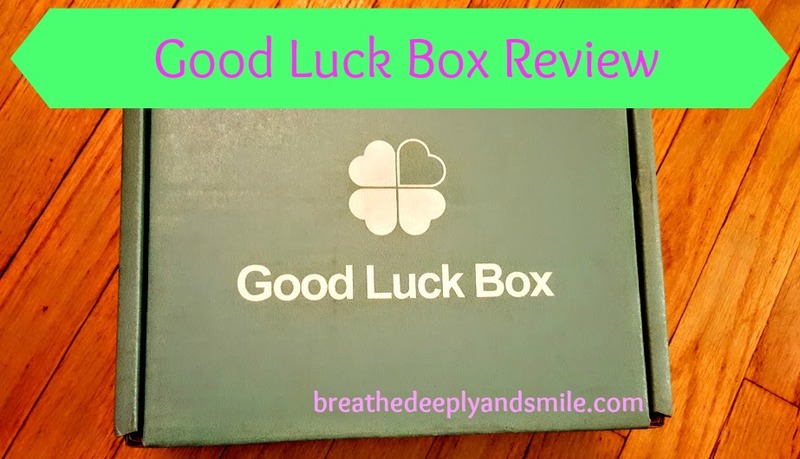 I was intrigued by the idea of Good Luck Box when I heard I'd be receiving one as a Credit Union Cherry Blossom (CUCB) Race Ambassador because it seemed unique. 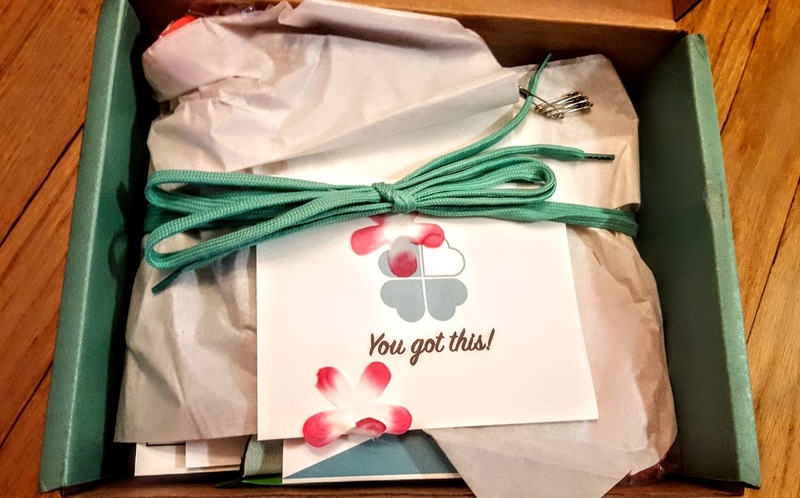 It's a box you can order online that comes with surprise handpicked running essentials for before, during, or after a race. 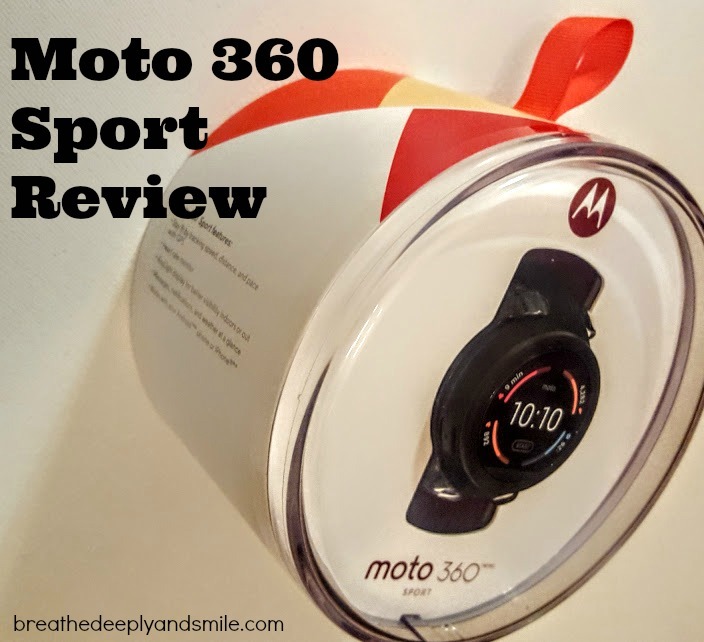 It can be a gift for you, a friend, a family member, or teammate and is delivered the week before the specified race. You can even tell the team a little bit about the person as well as selecting the gender of the box recipient to further tailor the items. Obviously because it was a box of surprises, I was excited when it arrived on my doorstep a couple weeks ago. Once I opened it I was even happier. The box was adorably wrapped with teal shoelaces and contained a little note card with some cherry blossom petals. I definitely "awwed" out loud when I saw how cute it was. I loved the message of good luck as well as the small touches such as the "lucky penny", safety pins, and printed words "Good Luck" on the shoelaces.